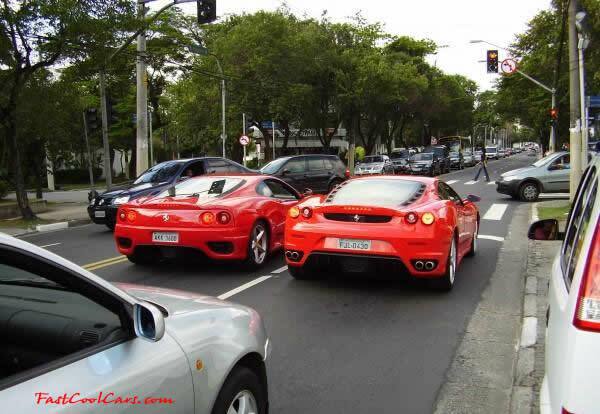 There are thousands of pictures of Exotic Supercars pictured from around the world. These super cars are seen in many different countries, in many different settings, from roaming down the highway, to parked in driveways and on the streets of busy cities. The pictures are of supercars like the Acura NSX - Ascari KZ1 - Aston Martin DB7, Vanquish - Bentley Arnage, Continental - BMW 645ci, Italdesign C2, M5, Z8 - Bugatti EB110, Veyron - Chevrolet Callaway, Z06 Corvette - DeTomaso Pantera - Dodge Viper - Ferrari 246, 348, 355, 360, 456, 512, 550, 575M, 612, Daytona, Enzo, F40, F50 - Ford GT40 - Jaguar XJ220 - Koenigsegg CC, CCR - Lamborghini Countach, Diablo, Gallardo, LM002, Miura, Murcielago - Lotec Sirius, Lotus Elise, Esprit - Maserati 3200 GT, MC 12, Quattroporte - McLaren F1 - Mercedes CLK GTR, Maybach, SLR - Nissan Skyline - Noble M12 GTO 3R - Pagani Zonda - Porsche 911, 911 GT2, 911 GT3, 911 Turbo, 959, Carrera GT, Cayenne - Qvale Mangusta - Rolls Royce Phantom - Saleen S7 - Shelby Cobra - Spyker C8 - TVR Cerbera, T350C, Tuscan - Vector W8 and others.